Planning commission members include Larry Coplen (closest to camera), Jon Garber on the left and Doug Ruch. 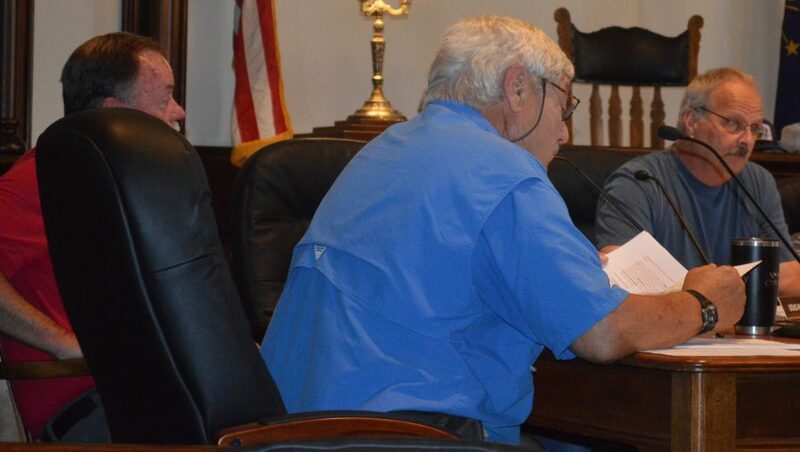 WARSAW — After a considerable amount of discussion, the Kosciusko County Area Planning Commission eventually voted to recommend denial of a road vacation petition by Monica Weigand during its regular monthly meeting Wednesday afternoon, Sept. 5, in Warsaw. Weigand is asking for a portion of a 24-foot wide platted roadway between 11140 and 11136 N. Ideal Beach Drive in Turkey Creek Township to be vacated. It is at Lake Wawasee. Because a fence was built in the right of way several years ago, an encroachment agreement was reached in 2003 with the county commissioners stipulating the fence could not be moved any further into the right of way. Also, in 2007 a judge issued a ruling saying a pier could not be placed at the end of the right of way. Steve Snyder, an attorney representing Weigand, said the property owner wants a clear title to be able to sell the property including owning the fence and 1 foot on the other side of it. But Mike Kissinger of the APC, also the county surveyor, said it appeared to him after looking at a survey of the property the fence had in fact been moved in violation of the encroachment agreement. County commissioners will consider the petition at their Tuesday, Sept. 18, meeting. In other business, after hearing a presentation at last month’s meeting about the negative aspects of wind farms, the APC reacted quickly and has drafted a proposed ordinance tightening the regulations against wind farms. “It is a much more restrictive posture,” said Dan Richard, area planning director. The ordinance, among other restrictions, would increase the setback requirements and only allow wind turbines to be placed on property zoned industrial III. An exception would need to be granted by the county board of zoning appeals. As part of the agenda for the 1 p.m. Oct. 3 meeting of the APC in the commissioners room, the ordinance will be considered for adoption. The APC also voted to ask the county commissioners to issue a moratorium preventing any wind farms from being approved before the ordinance takes effect. In other business, the APC approved a preliminary plat for Ronald and Deborah Hudson for a two-lot subdivision with residences already on each lot along SR 25, south of Rozella Road in Wayne Township. A temporary hardship was issued a few years ago by the county BZA but the status has changed for the Hudsons and other arrangements have been made. Approval was also given for the IU Foundation for a preliminary plat for a four-lot subdivision on Second Street, north of Armstrong Road in Oswego in Plain Township. The lots will be at Oswego Lake near the Oswego Cemetery and a cul-de-sac will be put in the subdivision. “There will be 50 feet of frontage for each lot,” Snyder said, noting most of the drainage will go into the lake but a catch basin will be installed. Also on the agenda, the APC approved a preliminary plat for a one-lot subdivision for Conservation Creek Woodlands & Wildland at the intersection of Natti Crow Road and Turkey Creek Road in Turkey Creek Township. A house will be built on the lot. Approval was recommended for the Shankster Brothers to rezone property from agricultural to commercial on Jefferson Street, south of Sycamore Street and just outside the town of Silver Lake. It is currently used as a commercial property and the county commissioners will consider the petition at their Sept. 18 meeting. Dana and Kathy Cone’s petition for a preliminary plat was tabled until the Oct. 3 meeting. The Cones are seeking residential development on 6.35 acres on Washington Street, east of First Street in Pierceton. The town of Pierceton requested the petition be tabled due to questions about the road layout and utilities in the plat.